Around this time of year, well early February moreso than March, but anyway, this time of year you usually can find plenty of pineapple (or SpongeBob's house as my kids refer to it) and mango on sale at the grocery stores and even the farmer's markets. 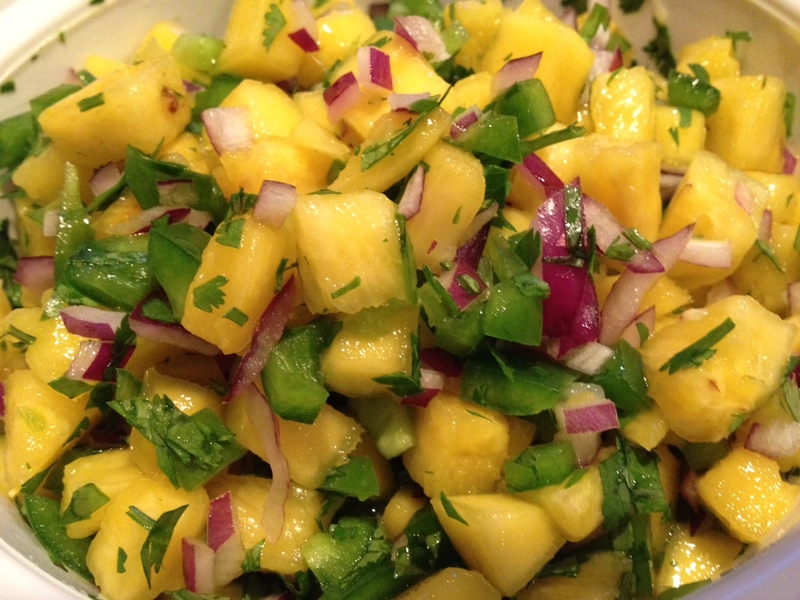 So what better to make than mango pineapple salsa. I've paired it with salmon, tilapia, tuna and pork. I'm sure it would be wonderful with seared shrimp as well. It's also good as a regular salsa, chip dippin type of salsa that is. Different, colorful, springy. Mix all together and let it sit in the fridge at least an hour if you can. You can also use lime juice and yellow onion if that's what you have on hand. For me the lime juice was a little too tangy especially if your mango wasn't terribly sweet. But, if that's all you have and it ends up being too (insert puckered lips sound here) first try to add a little more oil to even it out. If it's still too tangy add a smidge of raw honey or a pinch of your favorite sweetener. Enjoy.